Full version of this Delicious Life column appeared Cuisine Noir mag, April 2010. Have you checked the bridal magazines section of your local bookstore lately? I did when looking for inspiring culinary trends and traditions for this issue of Cuisine Noir. The magazines are glossy and glitzy and there are lots of them. On seductive covers and inside, I saw drop-dead gorgeous gowns, fantastical flower arrangements, breathtaking creative cakes, divinely-dressed tables — and color-coordinated decorative bites that showed food as an accessory. Pretty, yes. But did I want to eat it? Not really. Did I see culinary trends? Indeed. These chic and pretty presentations must be the trend because, well, not one magazine showed anything different. Was I inspired? I can’t say I was. 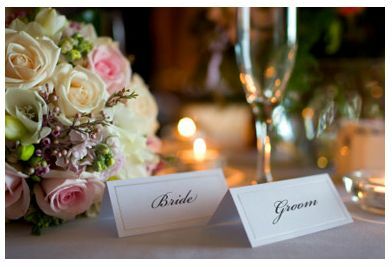 The wedding ceremony, wherever in the world it takes place, is about ritual and tradition. Isn’t it? 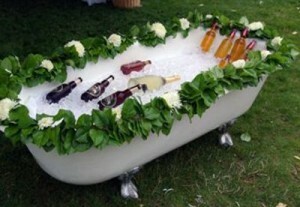 Booze bath at Thetis Island wedding, Canada. Perhaps for some people, commercialized modern-day wedding fantasy qualifies as ritual. I’m sure for those who have created the products and who feed off the market, it does. It doesn’t cut it for me, I confess. Did I see tradition? I can’t say I saw that, either. So I thought I’d share a few traditions and ideas: some old, some new, some borrowed and adapted; none blue. But I think that’s okay. In 1986, I interviewed the first mixed race couple to legally marry in South Africa. The Prohibition of Mixed Marriages Act, an apartheid law introduced in South Africa in 1949 that made it illegal for people of mixed races to marry each other, was repealed on the eve of their marriage. Read the full version of this story on Cuisine Noir mag here.